Padre Nuestro que estas en el cielo. santificado sea tu nombre, venga a nosotros tu reino, hagase tu voluntad asi en la tierra como en el cielo. Danos hoy nuestro pan de cada dia, y perdona nuestras ofensas como nosotros perdonamos a los que nos ofenden. No nos dejes caer en la tentacion y libranos del mal. Amen. The Mobius band is a surface with only one side. As a bracelet it has been designed so that an inscription can flow all around, inside and out, without end. 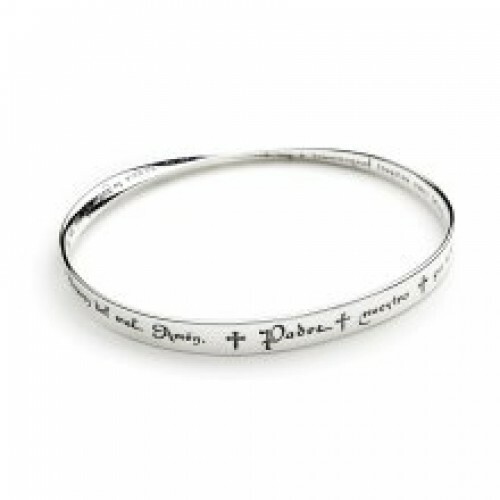 The unique properties of this design make the poetry, prayer or phrase, seem infinite. This exquisite bracelet made in the USA measures 8 1/4 inches in circumference, ellipse: 2 13/16 x 2 ½ inches and width: 3/16 - 5/16 inches. Available in Sterling Silver for immediate delivery and please allow 4 weeks for 14K Gold as these are made to order. It arrives in a beautiful gift box with the history and care for the piece nestled in. This makes for a beautiful presentation especially when it is wrapped!